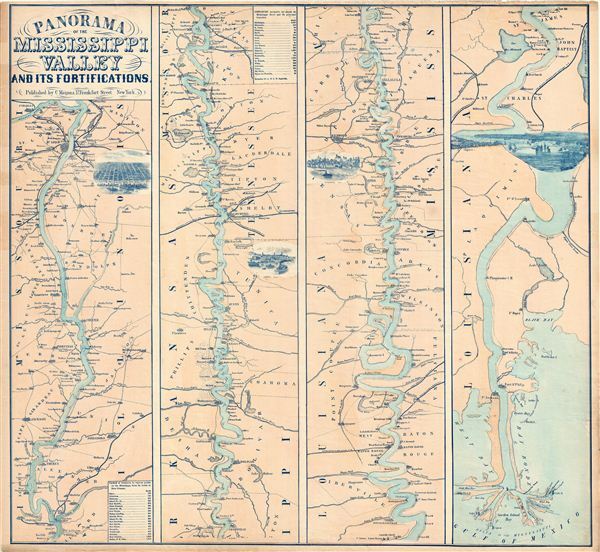 Mostly likely the finest commercially published Civil War Era map of the Mississippi River. An exceptionally scarce 1863 Charles Magnus Civil War era broadside map of the Mississippi River valley from St. Louis to the Delta of the Mississippi. This map, or as it is called 'panorama,' is presented in strip format divided into four distinct sections. each section is decorated with an engraved vignette view of the region's most prominent Mississippi port, from left these include New Orleans, Vicksburg, Memphis, and St. Louis. Though published at the height of the American Civil War the detail present throughout this map could only have been achieved through a personal reconnaissance of the river. Not only does the unknown author identify important cities and towns, which would have been common knowledge, but also lesser known country markets, trading posts, farms, saw mills and plantations. Moreover, many of the minor place names were doubtless derived from interviews with local authorities, some of these include 'Poverty Landing,' 'Hard Times Landing,' 'Dead Man's Bay,' and 'Devil's Tea Table.' Such a reconnaissance would have been impossible, or at least highly unlikely, during the years of the Civil War, so most probably the research behind this map took place in years just prior, 1859 or 1860. The choice of Charles Magnus, a New York based map and print publisher well connected with the United States military, further suggests that the cartographer was mostly likely a Union Man. Magnus is also probably behind the map's title, which includes 'And its Fortificaions' in bold print, wording clearly intended to appeal to those interested in the Mississippi theater of war. Control of the vital Mississippi River artery between St. Louis and New Orleans was tantamount to military dominance of the entire American Midwest. Magnus' map is mostly likely the finest commercially produced map of the Mississippi Valley to appear during the Civil War years. Charles Magnus (1826 - 1900) was a New York City based stationer, illustrator, bookseller, map, and print publisher active in the middle to late 19th century. Magnus was born in Elberfeld, Germany, as Julian Carl Magnus. Fleeing the March Revolution in Germany, the Magnus family immigrated to New York City in 1848. In New York, Charles' brother Carl Emil had already established himself as the editor of a German weekly newspaper, Deutsche Schnellpost. It was through his brother that Magnus learnt the printing and publishing trade. The earliest work to bear the Magnus inscription dated to the 1850s and includes various pictorial broadsides and maps intended to commemorate important events - the most notable for map enthusiasts being his 1855 map of New York commemorating the ' 79th Year of Independence of the United States'. During the 1860s and years of the American Civil War, Magnus, through various political connections, became one of the few illustrators with unrestricted access to Union military camps. He is consequently particularly well known for his authentic view of Civil War cities, personages, and events. Following the war, Magnus began to develop a prosperous business creating and selling panoramic city views, song sheets, and patriotic envelopes. In all Charles Magnus, with over 1000 known works, was one of the most prolific American printers of broadsides and other lithographs. Very good condition. Some edge wear. Rumsey 2397.000. Stephenson, Civil War maps: an annotated list of maps and atlases in the Library of Congress, 42.5.